Spend some time in Hawaii you’re bound to come across a good old fashioned poke counter: a simple deli style refrigerator filled with various troughs of seafood marinating in island inspired sauces. Ahhh… the good life. Delicious poke, marinated perfectly and ready to eat. That’s the poke we crave, and that is what Coast is all about. Our Poke Master, two-time Sam Choy Poke Contest Champion, Kelly Zubal hails from Honolulu. Together with the support of our amazing kitchen crew led by Chef Ryan (formerly of The Ritz Carlton - Kapalua) we take great pride in celebrating traditional poke recipes as well as creating mouth watering marinades that explode with flavor. Our commitment to quality runs deep. Our secret sauces and side dishes are all house made. You’ll never find us opening a can of corn and throwing it on the line or crushing up spicy potato chips as a topping (as good as that sounds) — we want to elevate your experience. We are committed to serving you the freshest, responsibly sourced seafood when possible, and we hope you enjoy the care and thought that went into each element in your bowl. We serve our rice at room temperature, to preserve the texture and flavors of the fish. Housemade gojuchang marinade, bean sprouts and cucumber. Poke. Some call it a trend, we call it comfort food. 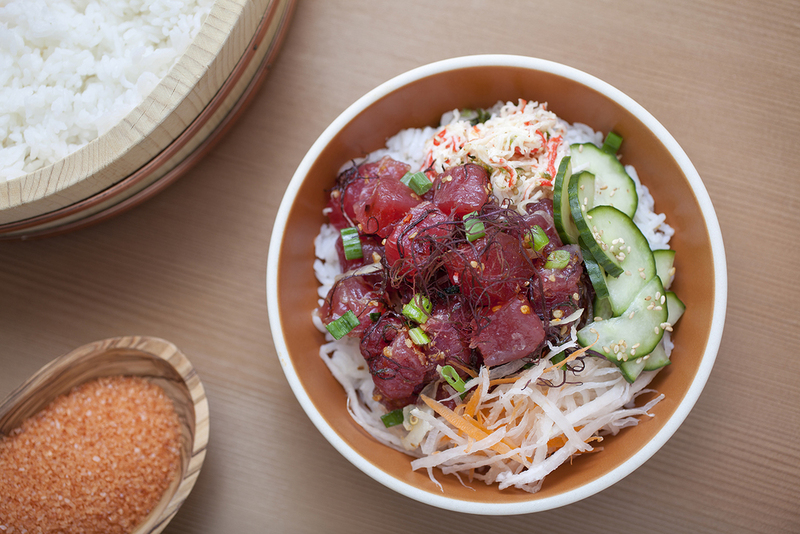 We’re proud to present poke the way you’d find it in Hawaii — made fresh daily, marinated in authentic ingredients that harmonize with the fish. Working with raw fish requires a delicate and nuanced approach. Blending the right textures and flavors for each type of fish is something our kitchen takes seriously. Our Poke Master, Kelly Zubal hails from Honolulu. She’s a two-time Sam Choy Poke Contest Champion and no one takes greater pride in perfecting a recipe than she does. Kelly approaches each new recipe with the whole bowl in mind, ensuring that you’re able to construct your lunch with just the right amount of texture, acidity, spice, richness and sweetness. We work closely with our suppliers to ensure that we’re able to offer the freshest catch and organic seasonal vegetables because every detail matters. With the support of our families and friends, we proudly present COAST. We look forward to sharing our love of poke with you soon.